Walid ibn Aqhabah replied: “By God we were not punished as much as you, Imam Hassan only insulted you”. Marwan told Imam Hassan: “Did you cuss the men of Quraysh?” Imam answered: “What are you going to do now?” Marwan said: “Now I will insult you and your father and your family, in a way that all slaves and handmaidens would talk about it.” Imam Hassan replied: “I did not insult you and your father, but God the Almighty has cursed you, your father, your family and your children and anyone who is born of your father until the Day of Judgment in the words of his messenger. 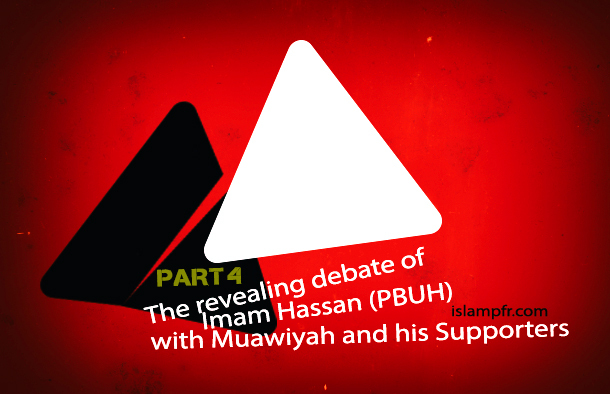 Then Imam Hassan rose up and shook his clothes and left the convocation. Afterwards they rose up and left there red-faced, furious and depressed.